Happy monday guys! May is ending, so excited to be welcoming the beautiful June, not only because of my birthday (of course) but because of the rush of summer as well haha'. Speaking of summer, the OOTD of today has a lot of it, i particularly loved how the light denim of the shirt blends so well with the floral print skirt which is now one of my favorite pieces, definitely going to rock this little one this season, it's from wwww.oasap.com wish i could have a whole dozen of them in different patterns so so comfortable. What are you expecting from summer? Which trends you can't wait to pull off this season? Feliz lunes a todos! Mayo termina, que emoción el estar dándole la bienvenida al hermoso Junio, no solo por ser el mes de mi cumpleaños (por supuesto) sino por todo lo que envuelve al verano también haha'. 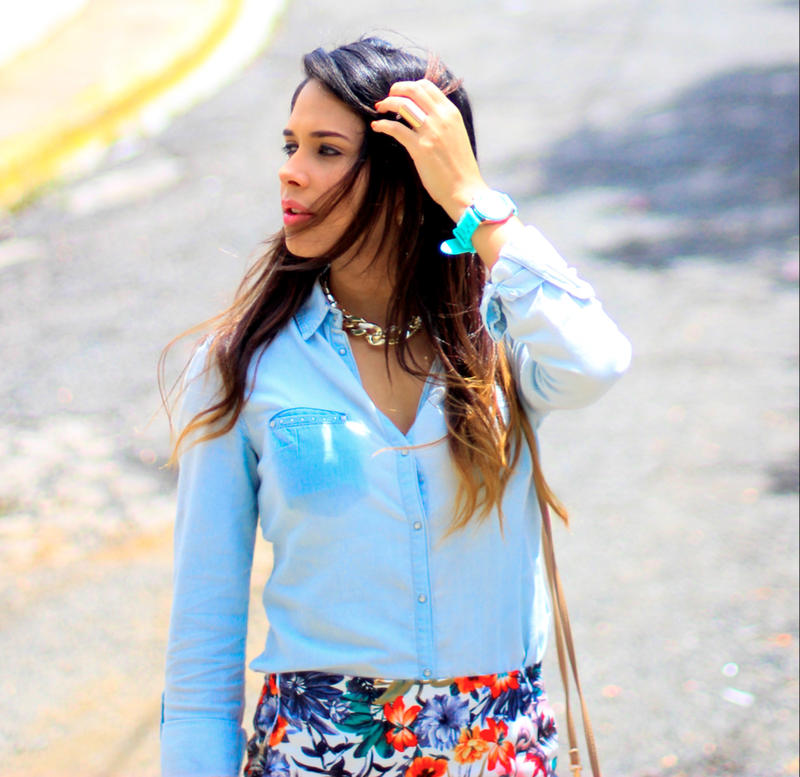 Hablando de verano, el OOTD del día de hoy tiene bastante de el, a mi particularmente me encantó como el light denim de la camisa se mezcló tan bien con esta mini falda floral que por cierto es ahora una de mis piezas favoritas sin lugar a dudas, definitivamente es una de las cosas en mi closet que más usare en esta estación, es de wwww.oasap.com me encantaría tener una docena de ellas con distintos estampados es sumamente cómoda. Que esperan del verano? Que tendencias no pueden esperar a usar? Es hermosa, a mi me fascina también!! thank you so much for following ! I'd love to follow you back! 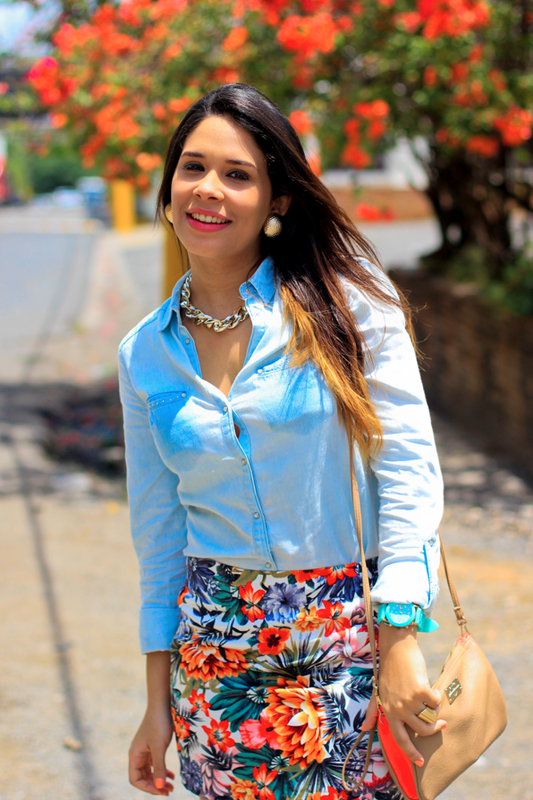 your blog is awesome and you look so gorgeous! so glad to be one of your reader now. I love this outfit! That denim top is the perfect summer denim shade! great combination with the top and skirt! I'm loving this look, the skirt is fantastic! Thanks for following me, I follow you now too! que guapa. 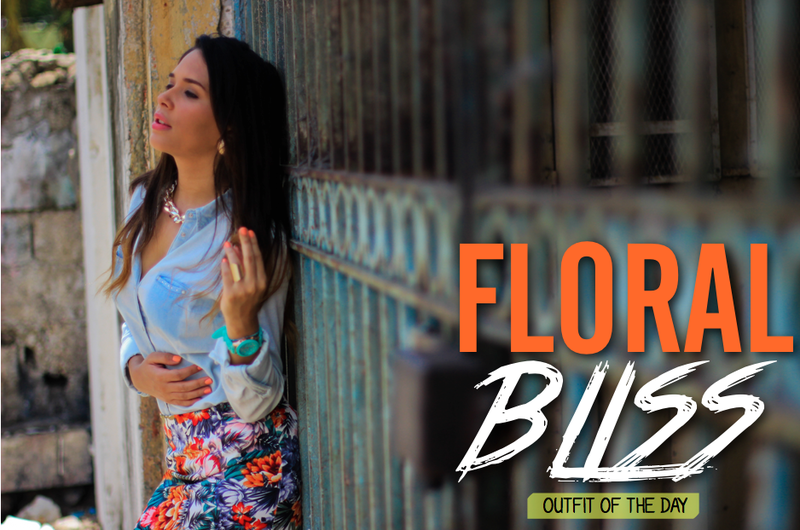 me encanta el estampado floral y todo el colorido del look!! Me chifla la falda y combinada con denim queda genial!!! stunning photos you look gorgeous!!! Lovely outfit! I really love your skirt! cute outfit -- love the color contrast on your clutch! That's an amazing look, plus I love your accessories! we're obsessed with florals, so obviously we're loving the skirt. we also really like the look of denim and florals paired together, so we think the chambray and skirt combo is sheer genius!! gorgeous outfit, it's making us long for summer!! LOVE the outfit and the bright colors! 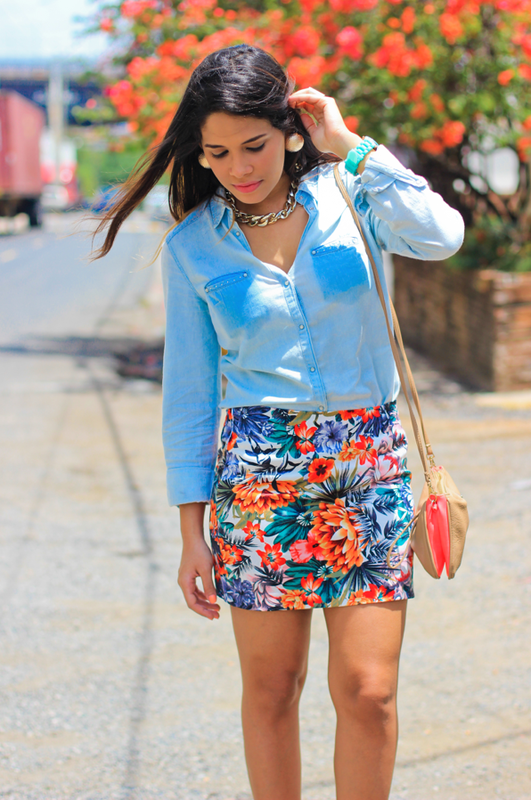 very nice denim shirt and you look really lovely in the floral skirt!